In an interview published in the 2012 book Gamers at Work: Stories Behind the Games People Play, gaming luminary Warren Spector mentioned something of a bombshell that seems to have gone unnoticed, saying that he "did some work for Valve on Half-Life stuff" in the early, pre-Disney days of Junction Point Studios. Outside of this book, Spector has acknowledged working with Valve, but never specifically said it was Half-Life-related. A then-nascent Junction Point made headlines in late 2005 when it stated on its website that it was "working with Valve on a new game using the Source Engine to be delivered via Steam," which some seemed to confuse for the separate "cartoon-style" "Super Secret Warren Spector Game Project" (Epic Mickey concept development) that Junction Point was hiring for at the same time. Spector has alluded to Junction Point's Valve work in interviews, referring to it as conceptual work, and told GamesRadar last year it was something he still "can't talk about." It's unknown how long Junction Point worked with Valve on Half-Life material, but Spector told Game Developer magazine in early 2007 that "what we’re doing now has nothing to do with Valve at all," indicating that Junction Point and Valve had parted ways by that time. So no need to have an apoplectic fit that Epic Mickey killed the chances of a Warren Spector Half-Life project. 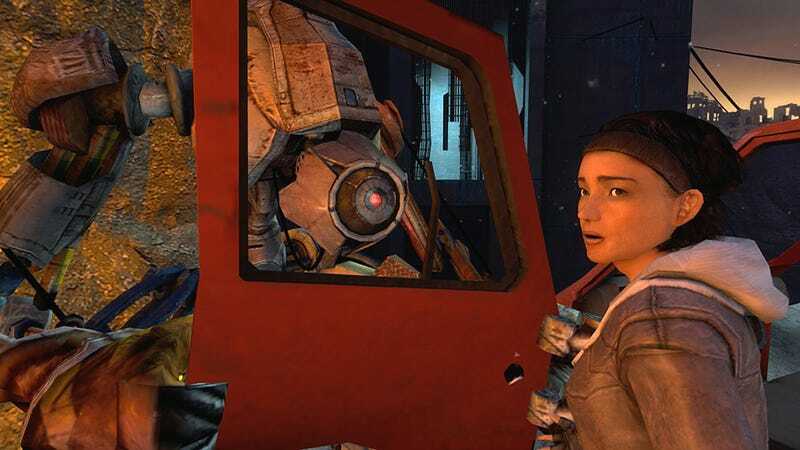 The work on Half-Life was just one of a number of projects from Junction Point's early days. Junction Point initially struck a deal with Majesco for "an epic fantasy game," but that went South when Majesco decided to exit the AAA market following disappointing returns on titles like Psychonauts and Advent Rising. Junction Point then did some concept development for an unnamed "filmmaker." By fall 2005, Spector was pitching "two concepts" to publishers: Sleeping Giants, a fantasy game based on an idea Spector and his wife originally conceived for a DC Comics comic book, and Necessary Evil, a science-fiction title that was essentially a spiritual successor to Deus Ex. An unnamed publisher picked up Sleeping Giants, and Junction Point was apparently still working on it as of March 2007. Junction Point also spent a year collaborating with John Woo on a contemporary ninja game called Ninja Gold, but the publisher for Ninja Gold dropped the project when it decided to cancel all its unannounced titles. According to the CV of a former 2K Marin staffer, the new AI companion for the forthcoming first piece of downloadable content for BioShock Infinite is named "Minibuddy." A producer who recently left Irrational Games for Bungie describes the expansion as "a unique first-person shooter experience set within the BioShock universe." Elizabeth Comstock—the companion from the main game—may very well not be returning: Courtnee Draper, the voice actress of the character, admitted last month that she had no idea what was going on with the game's DLC. BioShock mastermind Ken Levine said that Irrational didn't begin working on DLC for BioShock Infinite until after they wrapped development on the main game, and his comments indicate the first piece of DLC is still likely months away at the earliest. I would personally speculate that this DLC—and other Infinite DLC—might be comparable to the BioShock 2 expansion Minerva's Den, which featured a self-contained story with new characters that was divorced from the main game. In a job posting from last week, British indie studio The Chinese Room (developers of Dear Esther and the forthcoming Amnesia: A Machine for Pigs) said that they "[had] just signed a development deal with a major publisher and are expanding [their] team for a next-generation console project, scheduled for release in summer 2015." The copy on the posting also says the title is "open-world [and] first-person," and another opening suggests the game uses CryEngine 3. Last summer, The Chinese Room revealed its "spiritual successor to Dear Esther"—a first-person, open-world CryEngine 3 game titled Everybody’s Gone to the Rapture. The game, which tasked players to spend an hour in an English town trying to deal with an imminent apocalypse, was targeted for a "summer 2013" release date, but nary a word has been said since the announcement. Additionally, the page for Everybody's Gone to the Rapture has been removed from The Chinese Room's site, and the URL redirects to a generic page for a "Current Game"—the aforementioned next-generation title with "provisional launch date of 2015." The page also says that the developer "should be releasing some more information in late summer." Could this new title be an expanded version of Everybody's Gone to the Rapture, or is it something else entirely? Konami appears to be establishing a Los Angeles team to work on its sports games. Last week, a games recruitment agency posted several openings for an unnamed company "looking to build a new team in its existing L.A.-based studio with a focus to produce outstanding high-end production sports games on multiple console platforms." A number of the lines in the recruitment firm's postings match the openings for the nascent Kojima Productions Los Angeles Studio word for word. One of the agency postings from last week mentioned the team will be "[handling] contents [sic] developments intended for North America release while collaborating with HQ team." The recruitment firm posted an opening in late April mentioning that the role would have a start date of September. Last year, Konami opened a London studio to handle development on the Pro Evolution Soccer line, and this could very well be yet another support studio. But there presently a void when it comes to multiplatform MLB baseball games, and Konami does have an annual baseball series—the Japan-only Pro Yakyū Spirits. Also, Konami has released two MLB-licensed games in the past year. I am wondering if it might be Konami, not EA, that steps up to the plate for the next generation of baseball games.